How a Lottery Brought My Family to the U.S.A. 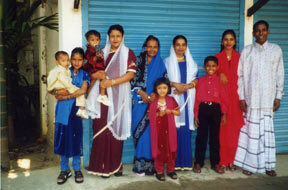 The author's family in Bangladesh before coming to the United States. My name is Shuva and this is about the biggest days of my life. It all started about 13 years ago when I was a little four-year-old girl in Bangladesh living with my family, my parents, my two sisters and two brothers. My brother was in a senior in high school in my country. He used to have a part-time job. Once when he was returning home, he saw that lots of people were buying something from a man. When he went to see, the man gave him a paper and said, “Good luck, young man.” Then when he came home and read the paper, he saw it said he could be a lottery winner. There were many prizes, but one of the luckiest prizes was to travel to United States. So he looked at the date and waited. After twelve days he saw in the newspaper that he was the biggest winner. His prize was to go to the U.S.A. as a visitor. He was excited to go to the U.S.A. and he asked my father if he could leave Bangladesh. But my father was not too sure about that so he had to think a lot. Some days later my father gave him permission to leave. That’s how my brother came to the U.S.A.
Three years later, after he had gotten his residency papers, he decided to go back to my country and get married, and also bring my dad with him. My brother got married, and then he left Bangladesh. When he arrived back in the U.S.A. with my dad, he applied for all of us and also for his wife to come to the U.S.A.. While my brother and my dad were in the U.S.A. we missed them a lot. But after waiting three years, I got a big surprise. One morning when I was in school, one of my cousins went to the school and said, “Hey, your father is here.” I was really surprised to hear that news. When I got home I saw lots of people were in our house and my father was there too. I jumped to my dad and gave him big hugs. He gave all of us delicious candy that we all enjoyed. After a few minutes he said, “I have a very big surprise for you all.” I could not wait to hear what the big surprise was. When we were at the table I asked my dad, “Please I can’t wait to get my surprise.” He said it wasn’t only for me it was for all of us. I told him, “Please tell us then.” He stood up and said, “I don’t know how you guys are going to take it, but at the end of this month we are going to the U.S.A.!” I was really happy to hear that but the next morning I woke up and started to realize that nothing would be the same after a month. I felt that I would miss everything around me. At the end of November my family started to pack. But I was so confused about what I would need in the U.S.A.. I thought I would find everything I needed. I asked my dad what would I need in the U.S.A.? Since he had been there. My dad told me I was right. I could find whatever I looked for in the U.S.A., but not my favorite memories – things like my favorite dress that my friend gave me. Two days before we came to the U.S.A. my house was full of people. There were our relatives from all over. Some of the people I didn’t know from anywhere. We had to take care of them and give what they needed. It’s part of our hospitality in my country. My dad bought tickets and when he showed them to us we were very excited. We saw that our flight was the next morning at 10:30 a.m. We know that we only had a day, so we needed to say bye to everyone. The next morning we woke up early and we were getting ready. All our things were already at the airport. The last thing was to get ready, so we all got ready. Everyone else was crying and it was a very emotional moment. I cried the most because I had so many friends and I knew I would miss them. When we got to the airport I was so excited because I had never ridden in an airplane in my life. I was also very scared. The airplane was very big and it just looked scary from the outside. A few moments later everything was ready for us to leave. My relatives from all over were in the airport to say bye and that was the last time I saw them. That was one of thehardest moments for me because I had to leave many of my family members back in my country. When we got inside the airplane we saw the big seats and a restroom inside. All the things were new to me, but everything looked just great. I sat with my sister. She was as scared as I was. We were holding each other while the plane was going. During our journey we ate our regular meal, but it had a different taste from our home food. After we ate, my sister and I went to sleep. After sleeping a long time my sister woke me up because we had to change planes in Brazil. I thought I was in the U.S.A.. But after a few hours we arrived in DC. But I was so sleepy that I didn’t even realize we were at the place we wanted to go to. When we got to Silver Spring, everything was very different outside, the street and the entire place I saw. But the old memories I still had when I closed my eyes.